With speed being so crucial in the technology rollout process, many organizations are involved in rollouts using agile development methodologies, where they’re actually co-creating the technology in real time with their vendor partners. This agile development process certainly has its advantages for organizations with adequate resources to devote to it. Large organizations have the staffing, resources, and capital to adapt quickly in this environment – learn fast, fail fast, and adapt fast. But how do smaller, midmarket companies with more limited resources adapt to this environment? The midmarket finds itself in an interesting position within the IT industry. While there are fewer players than the SMB market, and they may not have the financial clout of larger enterprises, midmarket organizations have been the fastest growing market segment in the US for the past several years. 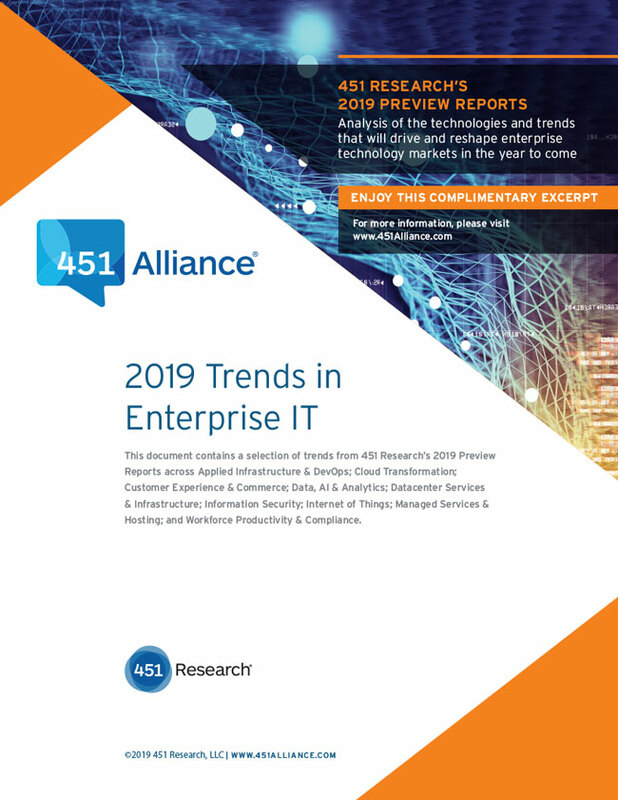 According to a recent 451 Alliance survey, the midmarket is committed to digital transformation, with 70% of midmarket respondents reporting that the majority of applications they have running on IaaS or in the cloud are mission-critical to their organizations. Where Are the Cloud Vendors? Help is on the way here, as vendors have noticed these challenges. Vendors are clamoring to offer cloud enablement support, through both their own builds and acquisitions of other companies. Collaboration with a vendor that offers this capability seems like a no-brainer given the heat in the market around these technologies. However, our research suggests otherwise. 62% of midmarket companies report no engagement with cloud enablement services – compare that to only 40% of larger enterprises. This lukewarm response from midmarket companies reveals a trend: midsized companies are hesitant to hand over control to third-party cloud vendors. What Are Midsized Companies Willing to Outsource? We asked the 451 Alliance what they were most likely to turn to cloud enablement vendors for. Midsized companies pointed to platform expertise and security expertise as the most common reasons, with other prominent factors outlined below. Whether turning to outside vendors or providing in-house support, the midmarket is embracing the cloud and acknowledging the complexities and challenges that will come with heterogeneous IT environments. From this market shift comes the goal of having an integrated process between infrastructure operation and application development teams to achieve faster time to market without compromising mission-critical processes.